BECOME FIT, STRENGTHEN AND SHAPE YOUR BODY! Sport2People resistance bands for exercise are perfect for your everyday workout at your home, gym and fitness or on your trip. StrechMe stretch bands have been designed for explosive endurance strength training and make a great addition to any home or gym routine you already perform. 42% STRONGER! Sport2people loop bands are made of heavy, reliable latex, without rubber smell and are LABORATORY TESTED! GREAT PHYSICAL THERAPY EQUIPMENT FOR REHABILITATION AFTER INJURIES OR TREATMENTS. Our exercise bands come in 5 different resistances and colors, so you can meet the needs of your workouts, no matter what level you’re at. Resistance levels are printed on the front of each, for easy recognition. COMPLETE RESISTANCE BAND SET TO GET YOU STRONGER AND FIT! Perfect for men, women and children! With length of 10″ and width of 2″ they are easy to grip and they don’t roll up through your body. READY TO BECOME A FITNESS LOOP EXPERT? Take your fitness goals to new heights with Sport2People workout bands and get a FREE E-BOOK with detailed exercises on 63 pages! You`ll find countless list of different workout routines to use these bands for, many of which you never thought of doing. GET THE MOST OF IT! You can use elastic bands to warm you up, to strengthen your muscles, to shape your body or to recover after workout. WE GUARANTEE, YOU`LL 100% ENJOY IT OR YOUR MONEY BACK! WANT THE PERFECT TRAVEL WORKOUT GEAR OR MINI GYM IN A SMALL BAG? Keep it at any place, take it wherever you go or use it when you have a free moment – at job, vacations, on traveling.. Fitness bands for exercise come in a handy small mesh bag. You can put it in your purse, suitcase or backpack and they are always ready for some workouts. IMPROVE YOUR SQUATS AND GENERAL MOBILITY AND NEVER SKIP YOUR DAILY WORKOUTS! Strengthen your abs and hips and stretch out! ENJOY YOUR SPORTS AND EVERYDAY ACTIVITIES WITH SPORT2PEOPLE BANDS OR YOUR MONEY BACK! 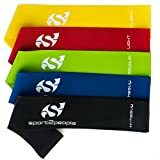 Purchase Sport2People Stretch Bands with all around protection. Whether you need a replacement or resistance bands for legs just aren’t working out, send it back our way and we’ll find what you need, or refund your money. Buy with confidence knowing that no matter what, we’ve got your back! Make sure you BUY 2 PACKAGES TO RECEIVE 5% OFF and have for a gift! Are YOU READY to Get In the Best Shape in Your Life, Improve your Squats and General Mobility with our Resistance Loop Set? These exercise bands will help you to actually work on building strength in your arms, hips and legs and to become more active and fit! YOU CAN FINALLY ENJOY YOUR EXERCISES WITH OUR HIGH QUALITY LOOP BAND SET, 42% STRONGER AND LABORATORY TESTED. They are made from latest technology of materials, like strong reliable latex, so they don’t loose any stretchiness and make no smell. This are perfect size loops with 10×2 inches, easy to grip and must have equipment for your home. Perfect length for a variety of exercises and perfect width so bands don’t roll through your body while working. YOU`RE JUST ONE CLICK AWAY! TAKE YOUR TRAVEL WORKOUT GEAR OR MINI GYM IN A HANDY SMALL MESH BAG! You don’t need to skip your daily workouts anymore during the travels or all day work. Just take your exercise bands in neat little package to wherever you go and use it whenever you catch a free moment – at job, vacations or during the trip. PERFECT FOR EXERCISES AND REHABILITATION You can make your Physical Therapy with our Bands as well! Recover your leg and knee injuries, or reshape your body after having a baby. You can also stretch yourself perfectly and practise your yoga. 100% GUARANTEE – EGGHEAD APPROVED! Every single resistance band is laboratory tested so That`s why we can offer you a lifetime guarantee. Whether you need a replacement, or the bands just aren`t working out, send them back our way and we’ll either find what you need, or get you 100% refund. Original manufacturer’s warranty applies only to purchases made from Sport2People and no other sellers. Finally make an ACTION, Without Excuses And Get a Complete Loop Training Set with Workout E-BOOK manuals in Just a Few days! Click “ADD TO CART BUTTON” NOW and Find Out What You’ve Been Missing! This entry was posted in Fitness Products and tagged Band, Bands, BEST, Elastic, Endurance, Equipment, Exercise, Explosive, Fitness, From, Latex, legs, Loop, Natural, Physical, Resistance, Sport2People, Strength, Stretch, Therapy, Training, Workout by Summer 365. Bookmark the permalink.